St. Catharines is a vibrant city on Lake Ontario just northwest of Niagara Falls, known for its lakefront, parks, and vineyards. As a focal point of the 1850s abolition movement, St. Catharines is an important landmark in Black Canadian history. Its rich arts and culture scene also draws visitors from around the Niagara region and beyond. 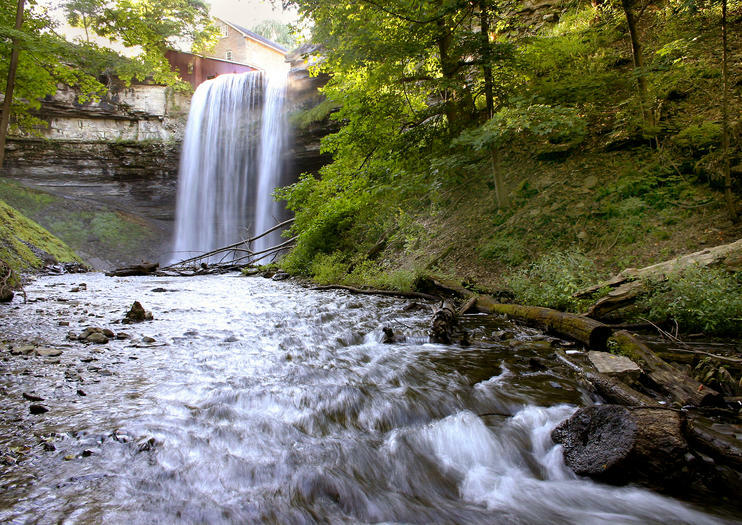 Fondly known as the Garden City, St. Catharines contains 1,000 acres (4 square kilometers) of parkland. Top attractions include Montebello Park, designed by New York City’s Central Park architect, Frederick Law Olmsted; Lakeside Park’s beach, 111-year old carousel, and Port Dalhousie lighthouse; and Burgoyne Woods, which features miles of walking trails and picnic areas. The downtown core boasts an array of world-class restaurants and music venues, as well as museums, sports arenas, and farmers markets. St. Catharines also pulls its weight as a producer of Niagara Region wines, housing the popular Henry of Pelham Winery and Harvest Estates. St. Catharines is a popular stop on the route between Niagara Falls and Toronto. Water-based tours and activities typically run from May to September, as Lake Ontario freezes over the winter. St. Catharines is a kid-friendly city: Check out the Lakeside Park playground, Happy Rolph’s Animal Farm, or the viewing platform at the St. Catharines Museum and Welland Canals Centre. Many of the attractions and businesses in St. Catharines are accessible to wheelchair users. Located just 12 miles (19 kilometers) from Niagara Falls, St. Catharines is easily accessible by car: Simply follow Queen Elizabeth Way north. Alternatively, Toronto’s GO Transit offers train service between Toronto and Niagara, with a stop at St. Catharines Fairview Mall. The city’s position between Lake Ontario and Niagara Falls creates a unique, mild microclimate with an extended growing season. Visit in early spring to catch the orchards in full bloom and late fall for the grape harvest. St. Catharines is busiest during summer, when the beaches are open and waterfront activities abound. St. Catharines was one of the final destinations on the Underground Railroad, a network of routes and safe houses that slaves from the United States followed to seek freedom. The city became a hub for abolitionist activity during the 1850s, and new free black residents—including Harriet Tubman—bought land and established the British Methodist Episcopal Church, Salem Church shortly after. The church is now a National Historic Site and museum.